Yamaichi Electronics is expanding its already extensive portfolio of USB 2.0 and USB 3.0 products with the new USB series 3.1. A standard line of types A and C is offered, both in plug and socket variants. Cable assemblies in various variants and combinations are also available. The 9-pin version A is initially available in the TH variant. It is upwards compatible with older USB versions. Type C is available in a combination of SMT and TH pins. This is due to the high number of contacts, with 24 pins. Since version C is not compatible with legacy USB products, Yamaichi Electronics also offers adapters from type C to type A. These adapters are also available in the form of short cable assemblies to ensure greater flexibility. In general, Yamaichi Electronics has a broad offering of assembled cables, for example from type C to type C with 15 strands for high-speed data transmission, but also for applications from type C to USB 2.0 with only 5 strands. All cables can be fabricated with a wide variety of connectors, as needed by the customer. The high-quality processing and the injection moulding of the plugs is of course a given. For customers who would like to assemble their own cables, of course, the plug side is also available as a component with solder contacts. 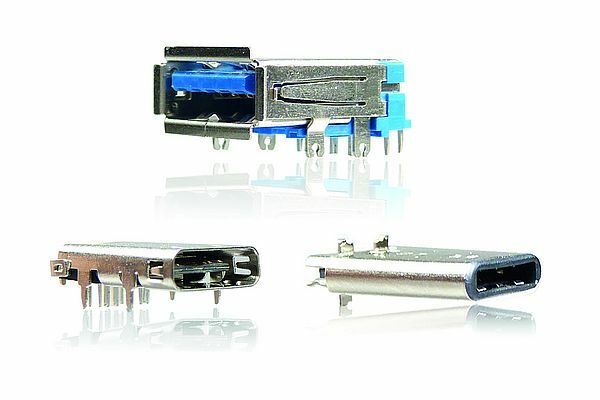 All USB 3.1 connectors and cable assemblies are plated with nickel-palladium and gold to ensure high transmission quality and guarantee the required number of plug cycles.